Ben Wang is the Director/Producer of the upcoming documentary film Breathin': The Eddy Zheng Story. The film's website explains that "after serving over 20 years behind bars for a robbery he committed at age 16, Chinese American community leader Eddy Zheng now faces deportation to China, a huge loss to the Bay Area community. Released from prison in 2007, Eddy has dedicated his life to preventing youth violence and delinquency through his work at the Community Youth Center, Community Response Network, and many other SF Bay Area programs and organizations." This month, Wang and other film makers initiated a fundraising drive as they enter into the major phase of filming. As this interview is being release there is one week left. You can visit their Kickstarter page to donate and learn more. Complementing Eddy Zheng's own website, news articles from 2002, 2005, and earlier this year, describe the various stages of the successful battle for his freedom from prison and the continued fight against deportation. Currently a resident of Oakland, California, Wang is the co-chair of the Asian Prisoner Support Committee. 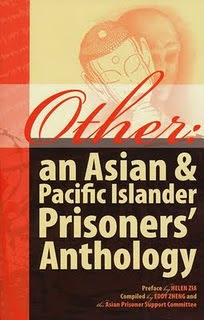 Wang co-edited with Eddy Zheng, the 2007 book Other: an API Prisoners' Anthology. In the accompanying video interview, Wang discusses working on the book with Zheng, the book's central themes, including the urgent need to give voice to API prisoners and the legacy of the WW2-era imprisonment of Japanese Americans in US concentration camps (view photos from "relocation" in San Francisco). Ben Wang also co-directed the documentary film entitled, AOKI, about Richard Aoki (1938-2009), a third-generation Japanese American who became one of the founding members of the Black Panther Party. According to the film's website, AOKI also "highlights how Richard's leadership also made a significant impact on individuals and groups in the contemporary Asian American Movement. Richard's contributions to the groundbreaking organization Asian American Political Alliance (AAPA) and its involvement in the Third World Liberation Front (TWLF) student strike led to the formation of ethnic studies at U.C. Berkeley."